Also serving communities of Georgetown, Richmond, Cynthiana, Danville. There are 9 Memory Care Facilities in the Lexington area, with 8 in Lexington and 1 nearby. The average cost of memory care in Lexington is $5,242 per month. This is higher than the national median of $4,650. Cheaper nearby regions include Frankfort with an average starting cost of $4,275. To help you with your search, browse the 11 reviews below for memory care facilities in Lexington. On average, consumers rate memory care in Lexington 4.5 out of 5 stars. In Kentucky, an estimated 71,000 seniors are living with Alzheimer's disease in 2018, and that number is projected to grow to 86,000 by 2025, according to the Alzheimer's Association. About 11 percent of Lexington's population is aged 65 or older, and those who have been diagnosed with dementia may need to utilize one of the seven memory care facilities in the city, or the other two nearby. In Lexington, like the rest of Kentucky, the Kentucky Department for Aging and Independent Living oversees, licenses and regulates assisted living communities. Lexington's cost of living is appealing to seniors on a budget, coming in at 95 on a scale where 100 equals the national average. While seniors can save on healthcare, groceries and transportation, they will find that memory care facility expenses in Lexington are higher than the national average. Seniors in Kentucky do not have to pay taxes on social security income. As a result, they can have some extra cash in their budget every month to put toward memory care facility expenses. Seniors who enjoy all four seasons will find Lexington's climate favorable. The city experiences hot summers featuring highs in the upper 80s and cold winters with lows in the 20s. In addition, the area sees roughly 10 inches of snow annually. Rainfall totals in Lexington are higher than the national average as well; the city gets about 46 inches of rain a year, higher than the U.S. average of 39 inches. Lexington is home to world-class medical facilities, including those specializing in brain health and dementia care such as Baptist Health and Saint Joseph Hospital, in the event of medical emergencies or illness. Memory Care costs in Lexington start around $5,242 per month on average, while the nationwide average cost of memory care is $4,778 per month. To see a list of free memory care resources in Lexington, please visit our Assisted Living in Kentucky page. 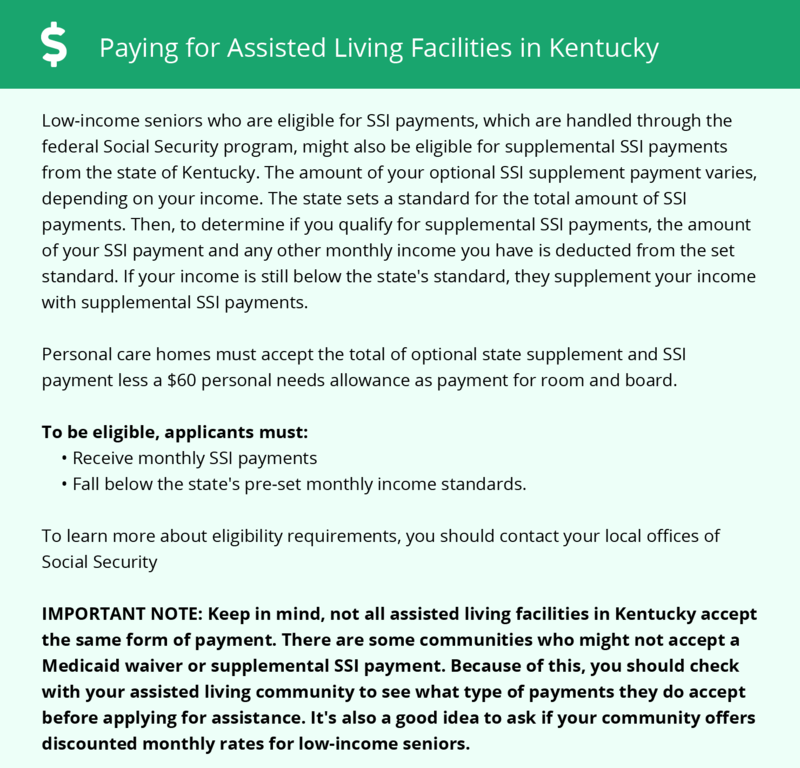 Lexington-area assisted living communities must adhere to the comprehensive set of state laws and regulations that all assisted living communities in Kentucky are required to follow. Visit our Memory Care in Kentucky page for more information about these laws.